Company: A.T. Biopower Co., Ltd. 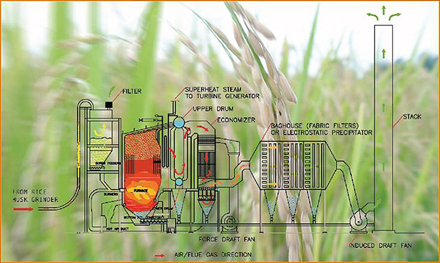 In 2005, A.T. Biopower Co., Ltd. built a biomass power plant in Pichit, Thailand. Using ground rice husks as its fuel, this plant generates 22.5 MW of electricity, of which 20 MW is sold to the Electricity Generating Authority of Thailand (EGAT). The plant was built with the support of the Thai government's Ministry of Energy, which is promoting the construction of power plants by small power producers (SPP) that utilize hydro, biomass, or thermal cogeneration technology. In addition to promoting the use of renewable energy sources, this policy aims to reduce the country's dependence on imported fuel. At present, about 90% of the electricity generated in Thailand comes from power plants that rely on non-renewable fossil fuels, namely, oil, coal, and natural gas. If no effort is made to find and develop new energy sources, it is estimated that the country's coal and natural gas reserves will be completely exhausted in the next 30 years. The use of modern technology to generate power from rice husks and other kinds of agricultural waste will not only contribute to the country's energy independence, but will also help to reduce environmental pollution and provide employment opportunities for the local community. For A.T. Biopower's biomass cogeneration power plant, Yokogawa Thailand successfully installed the CENTUM CS 3000 production control system, field instruments, and a continuous emission monitoring system (CEMS). The burning of the ground rice husks in the boiler's furnace chamber is a complex process that must be carefully controlled. Fuel oil-fired burners heat the combustion chamber. Once this chamber reaches 700-800 degrees C, ground rice husks are fed from a service silo to a fuel-air mixing system, where this mixture is compressed by air from a primary service fan and blown through the burners into the center of the combustion chamber. Adjustable vanes on the burners circulate the fuel-air mixture to maintain optimum combustion at 800-900 degrees C. At the same time, compressed outside air that has been drawn in by a forced draft fan and heated in an economizer is directed into the lower part of the combustion chamber in order to keep the ground rice husks in a suspended state and ensure complete combustion. Once the ground rice husks are burning steadily, the supply of fuel oil to the burners is gradually reduced and then stopped completely. With the pressure inside the combustion chamber in balance with the outflowing flue gases, the heat from the flue gas generates 480 degree C steam that drives the steam turbine. The flue gases are then released through the economizer to recover the remaining heat. Steam from that has passed through the turbine is cooled down by a condenser as a condensate. This condensate is transported as drops of water back to the boiler to be recycled as steam. Meanwhile, the heated cooling water that was used to condense the steam is cooled down in a cooling tower for reuse. This system is thus a closed-circuit type cooling system. 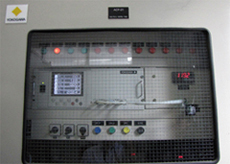 Yokogawa's CENTUM CS 3000 system handles all of these sequences as well as the control of feed water, steam temperature and pressure, and drum level, and uses sensory inputs from a Yokogawa zirconium oxygen analyzer to optimize combustion of the fuel in the furnace, thereby assuring the stable year-round supply of electricity to the national grid. And when the power plant switches to island mode, the system adjusts the boiler firing rate to decrease the supply of steam to the plant's steam turbine, thereby decreasing power production to a level that meets the plant's own requirements. All of these sequences are also configured in the CENTUM CS 3000 system. 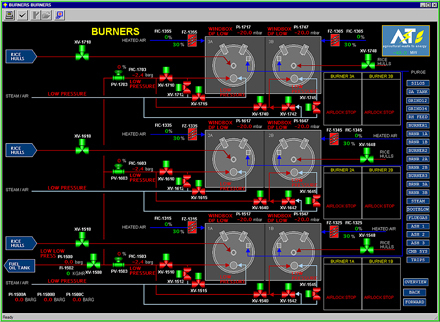 Graphic displays at the control stations give operators a clear view of what is going on throughout this system at any given time, ensuring that they have all the information needed to take quick and decisive action whenever intervention is required. After combustion in the furnace, the heavier particles fall down to the inclined bottom of the furnace and are swept out through an ash port by a screw conveyer for removal. Lighter particles mixed with flue gases are carried out of the combustion chamber through a flue port. An induced draft fan draws these flue gases into an electrostatic precipitator (ESP) that traps the lighter fly ash particles before the flue gases pass up the stack for discharge into the atmosphere. This flue gas is monitored by the Yokogawa CEMS, which measures CO, CO2, O2, NOx, and SOx concentrations for reporting to the government on a weekly and monthly basis. All water used in the plant is analyzed by a pH meter and conductivity meter so that it can be kept within an allowable range. 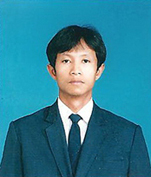 Chanapai Sahudsa, A.T. Biopower's Engineering Manager, had the following to say about Yokogawa's solutions: "This is the first plant to be approved by the Thai government under the Clean Development Mechanism (CDM) defined in the Kyoto Protocol. We are very happy to be using Yokogawa's system and products at this rice-husk-fuelled boiler plant, the world's largest of its type. We are always looking for ways to improve its operation and make the combustion process more efficient. 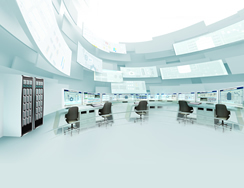 We always appreciate the solutions provided by Yokogawa Thailand."